Mork was created by Thomas Eriksen in the town of Halden in Norway during 2004. Both then and now the band functions as a one-man-band, much like many others within the Black Metal-genre. Mork was primarely a side-project for Eriksen from the inception until the debutalbum was made in 2013. The demo “Rota Til Ondskap” was compiled of recordings done between 2005-2007 and was released DIY-style as a limited 100-copies CD-R, in 2007. During the summer 2013 Eriksen visited the old rehersalhaunts of the norwegian band Darkthrone, which is and has always been a big part of his inspirations. The visit triggered such a big part of Eriksen’s inspirational flow that he went straight back home and made what would become the debutalbum “Isebakke”. “Isebakke” similar to the first demo was made into 100 CD-R copies just for fun and was never intended to be a big deal. However, the album was recieved very well and more people started showing attention to Mork. Recordlabels started to show an interest, which resulted in the now ongoing cooperation with the canadian label HSP-Productions. 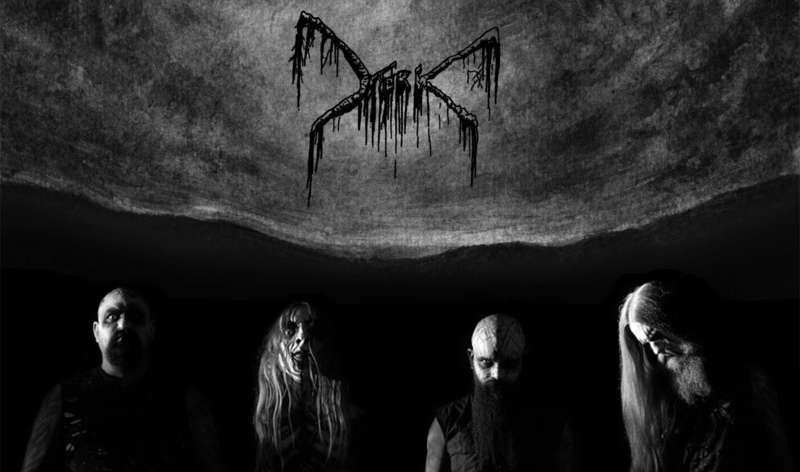 The debut “Isebakke” was released physically during 2014 and was praised by both critics and Black Metal-fans. Tracks from the album has gotten airplay several times after it’s release, including an airing at Silenoz’s (Dimmu Borgir) show 333 – Half Evil. 2014 was also the year when Eriksen gathered enough members to make Mork into an full live-act. The band debuted live in january 2015 in Olsztyn, Poland. 2015 saw the release of the EP “Fortid Og Fremtid” which is a compilations of re-recorded songs of the first demo as well as a new track and a live track. December 2015 Mork released the digital single “I Sluket Av Myra” along with a music video and was named “BAND of the WEEK” by Fenriz (Darkthrone). The video was premiered at Metal Hammer Norway. 2016 would show to be the year Mork bacome more active than ever. The second album “Den Vandrende Skygge” was released in February to much praise from critics and fans alike. The album includes a special-guest apperance by Nocturno Culto (Darkthrone) who does vocals on the track “Hudbreiderens Revir”. This song appeared on Radio Fenriz, run by Fenriz (Darkthrone). The releaseparty was also the first of several live-shows along the new band Order, including members from Mayhem, Satyricon and Gluecifer. Eastertime, Mork played a sucsessfull show infront of a packed venue at the Inferno Metal Festival, in Oslo. The show spawned positive reviews, among others a 8/10 in Metal Hammer UK. The band then went on to play at the Tons Of Rock festival in the bands hometown of Halden, in June. The very first tour accured in July, when Mork traveled across the atlantic for a two-week tour of Canada. While the third album is in progress, the shows continues, including one show in Tirol, Austria, in November. 2016 has brought Mork shows in Norway, Denmark, Canada, Austria and closing the year with more shows, including one in Gran Canaria, Spain. A big year for Mork which also earned the band a own chapter in Dayal Patterson’s latest Cult Never Dies-book. 2017 started early March with shows at the Garage in Bergen with Order and the Rockefeller Music Hall in Oslo with Nidingr. This also was the first shows with Ragnarok-drummer Malignant behind the kit. Later in March the band was brought to Turkey to perform in Izmir by Dystopia Promoters, who had Mayhem there in 1990. This made Mork the second black metal-band ever to play this city and the response was huge amongst the Izmir metal-fans. April/May the band continues to gig in Norway and amongst other places visited Kristiansand for the first time, which lyes in the middle of the Norwegian bible-belt. This would be the first show together with norwegian doom metal band Abyssic. Mork’s second book-appearance happened around the same time, in the second issue of Becoming The Forrest. During june the band started rehearsing with ex-Dimmu Borgir drummer Tjodalv, who had shown interest of stepping in whenever Malignant was on the road with Ragnarok. Early summer Mork signed to Peaceville Records for album number three. Now Mork became label-buddies with Darkthrone among others on a bigger label. In july the band was joined by Nocturno Culto on stage during a show in Trysil, performing ‘Hudbreiderens Revir’. In August Peaceville released the digital single and music-video ‘I Hornenes Bilde’ which spread like wildfire on the internet. The video was compiled of footage from the bands show at Rockefeller Music Hall, in march, shot by Punkrockphoto. In the beginning of September the band played the Hellbotn Metalfest in Kolbotn, Norway. Later the same month it was announced that Mork would play their first UK-show in London the following October. The show was booked by Cult Never Dies and Becoming The forest. Peaceville released the second track ‘Mørkets Alter’ in form of a lyric-video in the boosting of the exclusive London-show. October 13th saw the release of third album ‘Eremittens Dal’ in all formats. The album includes special guest-vocals by Silenoz (Dimmu Borgir) and guest-bass-guitar by Seidemann (1349). The album artwork is done exclusively by Jannicke Wiese-Hansen, famous for making the cover art for early Burzum and Satyricon albums. ‘Eremittens Dal’ received positive reviews from both fans and critics. Around the same time of release the band and Halden Mikrobryggeri (Beer brewery) colaborated on a Mork beer named “Gravøl”, which was a brown ale, bottled and on tap. In November the band played the first of several shows together with Seidemann’s Svart Lotus at Revolver in Oslo. The bands toured together through February 2018. Early 2018 Mork signs with bookers; Massive Music (Europe) and Rockaway (Scandinavia). Throughout the summer and late summer the band plays festival-shows, including Midgardsblot in Norway and the concert debut in Romania at Dark Bombastic Evening Held in Transylvania. Mork debut album “Isebakke” and second album “Den Vandrende Skygge” was re-released by Peaceville Records in July and August. In September the band played the Spetakkel Festival in Larvik with Insidious Disease and at Brygga Kultursal in Halden with Satyricon. 2018 was wrapped up with a sold out show in Oslo in December. 2019 saw the release of the single «På Tvers Av Tidene» alongside a lyric-video. A bit later the second single and music-video «I Flammens Favn» and lastly a third one «Siste Reis» accompanied by a artwork-video. In early march the band headlined the Chimera Dark Night Festival in Prague, Czech. During easter Mork returned to the Inferno Festival which also saw the release of the fourth album “Det Svarte Juv”. A new «Mork Gravøl» beer was brewed by Grünerløkka Brygghus in Oslo in shape of an Irish Stout with smoke and chili-taste. The beer is available in both bottle and tap.